So I couldn’t decide what to make for dinner tonight. Eggplant Rollatini with Pesto Ricotta? 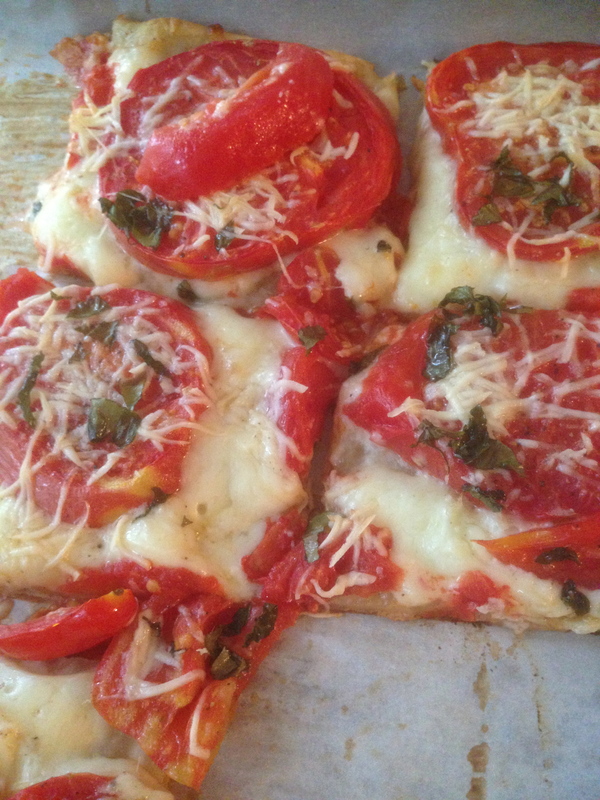 And then I got an email from The Kitchn.com: Three Cheese Tomato Tart. Wha-WHAT? That SERIOUSLY looks easy enough that I can pull it off in-between the 17 million tasks I need to accomplish this afternoon! YAYAYAYAY! 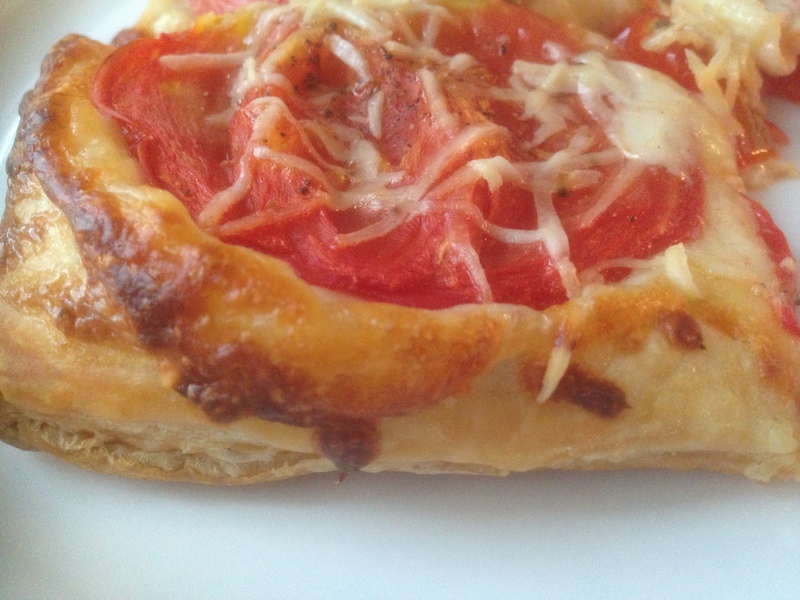 PLUS – I even have a puff pastry in the freezer. So basically, you defrost the puff pastry, let the sliced tomatoes dry on some paper towels, use a bit of MAYONNAISE as a base of the tart (I had no idea about the Southern tradition of slathering the world with Mayo). Then you use 2 kinds of shredded cheese, the patted dry tomatoes, some grated parmesan, a generous crank (or 7) of the salt and pepper mills, and a handful of freshly torn basil. Shove that bad boy into a hot oven for 20-30 minutes and Voila! DINNER IS SERVED! The basil looks all nice and frizzled here, doesn’t it? 2 Ripe Tomatoes, sliced into about 8/tomato **I used backyard tomatoes. You need something YUMMY and AMAZING here. Splurge. You deserve it. 3 T Light Mayonnaise **haha. Light. 1/2 C Shredded Cheddar Cheese **I used Monterey Jack bec that’s what I had on hand. Feel free to experiment. 1/2 C Shredded Mozzarella Cheese. **I used cheap pre-shredded stuff. I lazy. 2- Lay out the tomato slices on a large sheet of paper towels. Cover with another layer and allow to drain for 30+ minutes (this keeps your tart from getting watery). At the same time, all your frozen puff pastry to thaw on your counter for the same 30+ minutes. 3- Unfold your puff pastry onto a parchment-lined backing sheet, pinching to close any holes in the seams. Using a fork, prick the dough all over to prevent it from puffing up during baking. 4- Spread a thin layer of mayonnaise over the entire puff pastry. Sprinkle evenly with shredded cheddar (or monterey jack) and mozzarella cheeses. Arrange the tomato slices over the cheese. Season generously with kosher salt and pepper. 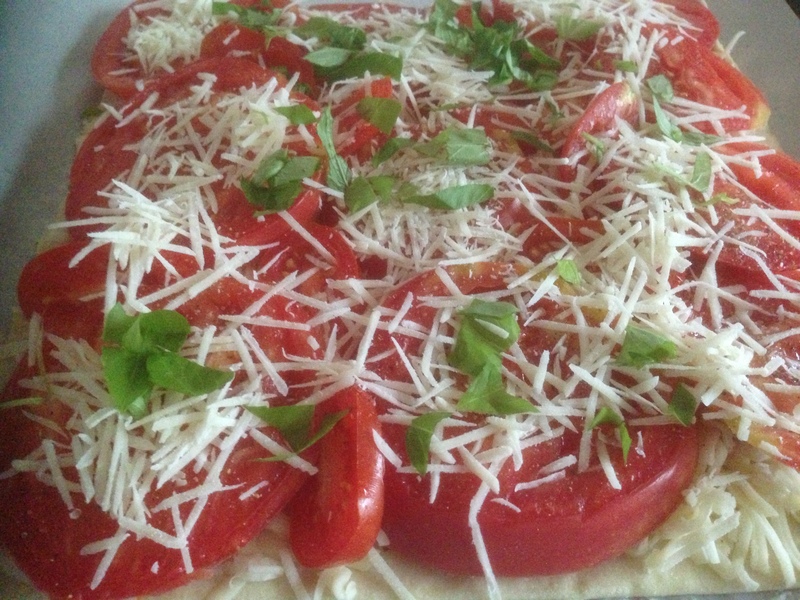 Grate a generous amount of Parmesan cheese on top and garnish with freshly chopped basil. 5- Bake for 30 minutes, until the pastry is golden brown and the cheese is melted. Remove the pastry from the baking sheet and let cool on a wire rack for 5 minutes. Cut into 9 squares and serve immediately. I was surprised at the tang the mayo leant the tart. Not 100% sold on it, but it was nice. 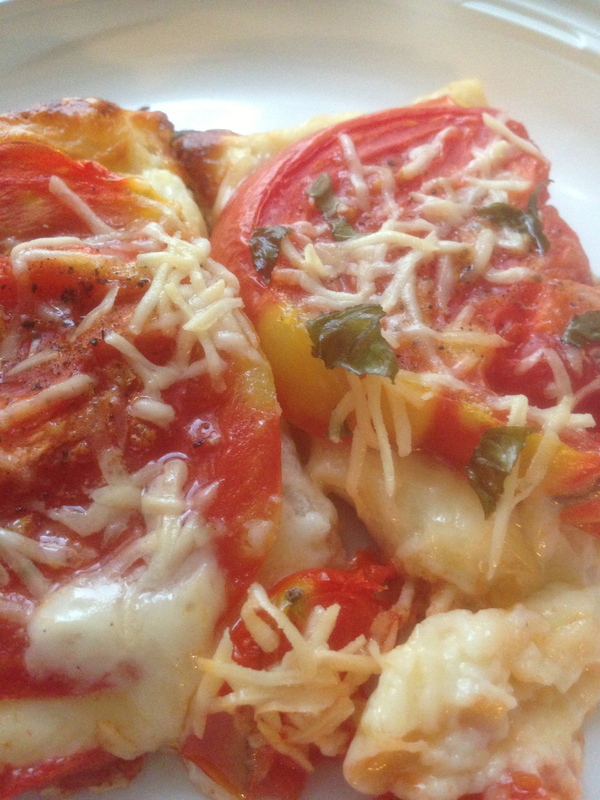 Mostly though, I looooooooooved the fresh garden tomatoes with melty gooey cheese on crisp and puffy pastry. MmmmmmMmmmm. Oh, and R had seconds. J chose to eat a salad for dinner instead. Even after I called it a pizza. Love it. It looks like a deluxe pizza. Sorry J didn’t agree. I made an onion tart the other night that was fabulous. We were having a meat meal so I used parve margarine a c ‘ whipping cream’ for the dough and custard. But what u actually had was ‘whipped cream’. So I smushed it with the onions and it was delicious. I made the dough into two pie crusts and used a humongous onion and Dad and I ate all but two pieces for dinner. Yummy!